The Hunt Comfort Specialist Super Light Gel Core Folding Seat designed to place all day comfort where it is needed the most. Specialist is made with Comforted 338 fabric, capable of enduring seasons of hunting duty while improving the enjoyment of every hunt. Gel Core formula provides state of the art comfort created by two embedded elliptical gel pads in specialized, high resiliency medical grade foam. Built to reduce and gently distribute your seated pressure. Helps to eliminate the annoying pain and nerve compression that comes from sitting still, so you can enjoy your precious hunting time and forget about hurting. 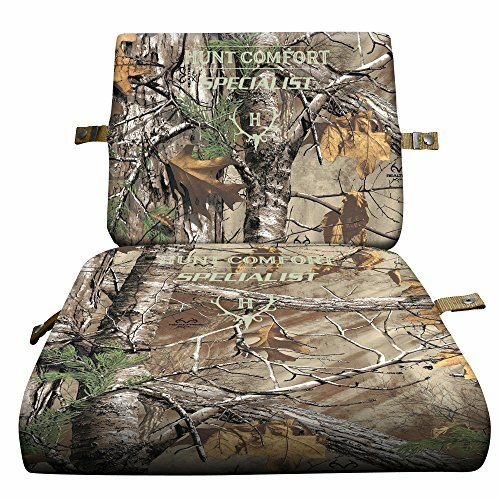 Cushion has been found useful in duck blinds, tree stands and boats to adding extra comfort to utility vehicles and on top of coolers on game day. Easy to tote afield with the 1.5 in. heavy duty utility strap with side release buckle and FC-1 snap attachment points. The Specialist comes with 3 year total quality warranty and lifetime cushion core warranty. Season after season, Hunt Comfort frees hunters from the annoying distractions of discomfort. We make keeping still and quiet easy, and that leads to hunting success.